Robin Wilson, an eco-friendly interior designer and Creative Director of The Nest Store introduces us to eco-chic furniture made out of materials such as concrete metal, soy, bamboo, organic cotton, micro-cotton and mango wood. 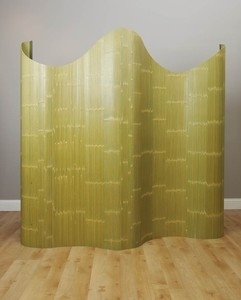 Divide your room or workspace with this lightweight bamboo panel. It can be curled in a variety of ways and is easy to remove or just fold it up and place in a corner. Choose from chocolate, natural, green or black. Yin-Yang Bamboo Panel, $320. 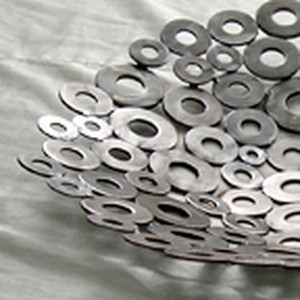 Use this washer bowl an accent piece, serving bowl or as dramatic wall art. Metal Washer Bowl, $95. This beautiful and luxurious bamboo coverlet is fit for a queen and her king. 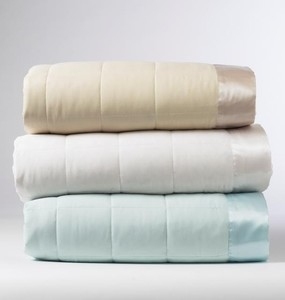 Bamboo Quilted Coverlet, $240-$250.